I see absolutely no way that this could go horribly wrong for baseball in the near future. Nope. Isolated incidents. Today's Birthday Team is where great names and good ballplayers meet. Puddin' Head, Fats, Baby Doll, and Tiny are all key players for the August 16 bunch. Barton, who spent his entire MLB career with Oakland, is pictured wearing a Blue Jays hat on his player page. Solid birthday team. No superstars, but no real weaknesses either. The Keltner test question "Could a team with Gene Woodling as the best player win a pennant?" would ordinarily be no, might be yes in this instance. Woodling may be the most anonymous really good Yankee. He put up almost 16 WAR, and a 128 OPS+ for the five year span where they won five straight WS. He later had a nice 4 year run with Cle and Bal. The Keltner test question "Could a team with Gene Woodling as the best player win a pennant?" would ordinarily be no, might be yes in this instance. Solid birthday team. No superstars, but no real weaknesses either. I feel like that's a reasonable description of Rodgers as a manager too. Solid, never going to be confused for a Hall of Famer, but always competent and sometimes better than that. he's from my (and LeBron's) hometown. He was very popular during his short stint in Cleveland. He was also one of many Yankees who hated Casey's guts for platooning him. He was, by all accounts, a fairly miserable fielder. I've always had an affection for players like Daric Barton, who would have no value were it not for the Base on Balls. They resemble my own self in high school. Sometimes it can be perverse to watch a player that has essentially no interest in ever hitting the ball hard, and will even avoid swinging if at all possible. Late career Luis Castillo was like this. Are there equivalents in other sports? Can one make a career in soccer or basketball by consistently shirking one's own primary duty, and hoping that the opponent just messes up? Today's the anniversary of Babe Ruth's death. Elvis's too and Aretha's, starting next year, I guess. he's from my (and LeBron's) hometown. That's an interesting question. There's a sub-class of strikers in soccer (poachers) who make their living by getting to the right place to pounce on a loose ball or lazy pass and put it away. I guess that's a type of player who largely relies on the other guys messing up. Given his career splits (846 OPS vs RHP, 721 vs LHP) I think Casey was right. From rField, looks like he was good early in his career, and then faded. Almost dead average overall. From my chess-tournament days I remember players who had a repertoire of traps – stronger players would ignore them and just play strong positional chess, but weaker and less experienced ones (like, me :) would take the "poisoned pawn" or whatever and get into trouble. That might be analogous. My undergrad school's football team was a regular contender for (though never a winner of) the Division III national championship, which is the Stagg Bowl, named for ol' Amos Alonzo. And I do mean old -- acc. to wikipedia, he coached until he was ~83. And even more interesting, he was in the inaugural class of the Basketball Hall of Fame, having played in Springfield, Mass., in the early days of the game. As a YMCA coach, apparently he popularized the five-man team concept. So the guy had a significant in three major sports -- thanks, Dan Lee, for sending me down the rabbit hole. 4 0 4 6 : only done twice, by Joe Stripp in 1930 and Jeremy Giambi in 2001. Who was Joe Stripp? He was a pretty good ballplayer, batted .294 lifetime (mainly as a third baseman), had an 11-year major-league career after three good seasons in strong minor leagues. 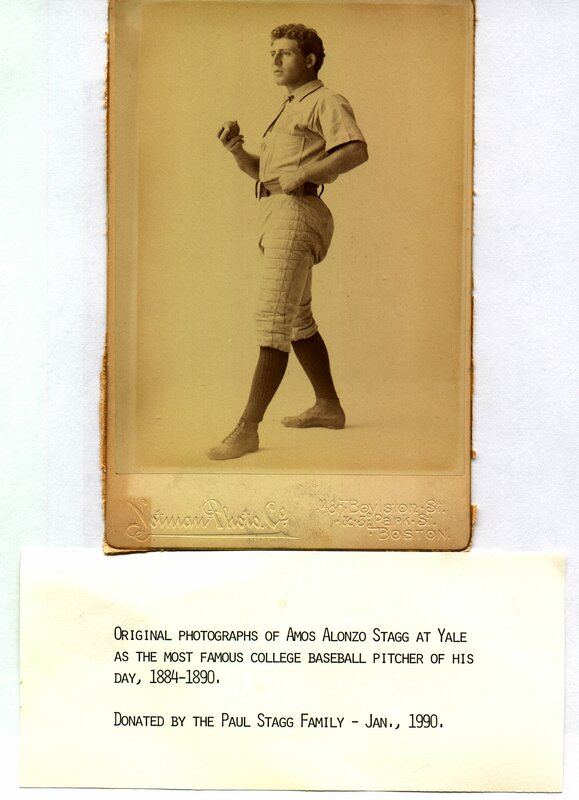 Stripp was the kind of player who started for "second-division" clubs (the Reds and Dodgers) but never caught on with any of the stronger teams of his day. This isn't equivalent, but there are plays in football that I suspect are designed knowing that they often induce defensive pass interference penalties. That seemed like a big part of the Ravens offense with Flacco one year. I was in an adult dodgeball league for a bit and there was this one huge Polynesian guy that had his own unique strategy that totally changed the game. Although most players will scamper up to the line to throw, and retreat back to defend, he would stand as close to the line as possible with a ball in his hands and then do nothing. There was a threat, of course, that he would throw the ball, and it was marvelously effective because it strongly discouraged anyone on the opposing team from approaching the line, and also allowed his own teammates to approach the line with impunity. It wouldn't have worked if he couldn't defend himself, and indeed despite his rotundity he had excellent reflexes, so you couldn't just take him out easily. Holding a ball also makes it easier to defend. I'm sure there's a military term for this, setting an advance position with a defensively-minded elite group in order to lay a claim to the disputed territory and allow your main forces to maneuver in freedom. But the long and short of it was that a fat guy would just stand there holding a ball, and it changed everything. Can one make a career in soccer or basketball by consistently shirking one's own primary duty, and hoping that the opponent just messes up? Isn't that pretty much the definition of soccer? Sometimes it can be perverse to watch a player that has essentially no interest in ever hitting the ball hard, and will even avoid swinging if at all possible. Recently demoted Phillies catcher/future utility man if he wants to get back to the majors Andrew Knapp is another one of these. And he was a first baseman! Must have been a good defensive first baseman. Thinking about my own question, I think that boxing's Rope a Dope might be the best example of this technique. Win a boxing match by showing no interest in throwing punches. Or in tennis, the players who just dink the ball back until the other player makes an unforced error. The difference being, of course, that those players never make it to the highest professional level of the sport. I actually saw the controversial player Gael Monfils try that strategy against Novak Djokovic at the US Open a couple years ago, repeatedly hitting slow shots with tremendous spin. Djokovic could get to them easily but because of the unpredictable spin he wasn't able to load up and hit big winners, so it was basically a creative stalling tactic. The fans actually began to boo Monfils! But I thought it was intelligent to try a strange strategy against a superior opponent. In one of the most bizarre tennis matches in recent memory, Novak Djokovic held off the always-unpredictable Gael Monfils ...Frustrated by Monfils’ wacky style and in-match antics, Djokovic ripped the collar of his shirt at one point, having let a love-40 lead on his opponent’s serve slip away... The Serbian ran through the second set, while many questioned if Monfils was giving his best effort as they watched him move slowly around the court, floating balls and sometimes batting away – or pummeling out of bounds – wildly silly errors. “This is totally bizarre,” John McEnroe said at one point on ESPN. He also called Monfils "unprofessional" at various points, as well. Goons in hockey are not there to ... you know ... play hockey. The exist to rough up the opponents, get in their heads and then into fights, and of course rack up penalty minutes. The other parts of actual hockey, not so much. I'm sure there's a military term for this, setting an advance position with a defensively-minded elite group in order to lay a claim to the disputed territory and allow your main forces to maneuver in freedom. The players are too well-paid and well-taken-care-of for any such shenanigans to take place. Especially in Chicago. Did that fat dodgeball player just invent something important? I guess now that wars are fought mostly by robots on top of very tall mountains it doesn't matter anymore. Not exactly the same thing, but the original plan for the Battle of Verdun was to threaten, but not take, the city, hoping the French would respond in force to hold the symbolically important fortress, and then pummel them with artillery. It might have worked, but for Germany's initial success in taking one of the key forts, and then changing their strategy to one of a more traditional offensive, and they wound up getting bloodied as bad as the French. Also, a favorite tactic of the Mongols would be to threaten and then retreat, sometimes for days, while their pursuers became stretched out, exhausted, and low on supplies. then they would strike and wipe them out. Important only to the specifics of dodgeball, I think. In war, a small force out well in advance of your main line (even if elite) is generally going to get pummeled and destroyed. It just doesn't have the ability to defend itself that you ascribe to this guy. If you need an advanced post, to provide a warning typically, you tend to use your most expendable forces. I think maybe I've mentioned this before, but having seen Damian Jackson play for my hometown minor league club for two seasons, I never ever expected him to be a useful MLB player. What I saw was a guy who couldn't really hit Double-A pitching (he slugged .316 in his second season in AA ball) and committed 90 (!) errors in '94-'95. He kept popping up in organizational top prospect lists and I could not fathom what everyone else saw that I didn't see. I was wrong. He turned into a nice player - good glove, good speed, adequate bat. A win for the scouting side in the scouts vs. stats debate. Michael Chang, too. Won the French Open as a teenager by being quick enough to get to everything and talented enough to keep the ball in play until the other guy screws up. edit: Looking at his Wikipedia page, I see that Chang is in the International Tennis Hall of Fame. He screams Hall of Very Good to me: One grand slam win, short (no pun intended) peak, never ranked #1 in the world. I mean no disrespect to the guy. He had a terrific career. It just seems like he's no better than the fourth best American male tennis player of the 1990s. Have you ever been? It's in Newport, and definitely worth a visit. But, they have a ton of inductees. If MLB had the same level of representation, everyone we think of as even Hall of Good, would be in. It just seems like he's no better than the fourth best American male tennis player of the 1990s. Sure, but Richie Ashburn was no better than the 4th best CF of the 50's. In war, a small force out well in advance of your main line (even if elite) is generally going to get pummeled and destroyed. But what if it was a really fat Polynesian force? Funny, I would have that dodgeball was an unimpeachable war analogy. He was also one of many Yankees who hated Casey's guts for platooning him. I thought about Casey on Tuesday, when Bob Melvin of the A's pinch hit Matt Olson for Mark Canha in the first inning after Mariners pitcher James Paxton got hurt. Righty Mark Canha had started against lefty Paxton, but after Jed Lowrie hit a line drive at Paxton and forced him out of the game two batters before Canha was due to bat, righty Felix Hernandez replaced Paxton. Bob Melvin pinch hit lefty Olson to regain the platoon advantage. But pinch hitting in the first inning to get the platoon advantage - that's a pure Casey Stengel move. I feel like, in that situation, it should be acceptable for Mark Canha to go home early. Michael Chang is one of the tennis players I've heard of. Therefore he should be in the Hall of Fame. Have you ever been? It's in Newport, and definitely worth a visit. No, I've never had a chance, but I'd like to go some time. I imagine they'd have some cool exhibits. I like the stuff on the early history of the game. The whole amateur vs pro thing of the pre-Open era is fascinating. Newport in general has a ton of stuff to do. Just don't go in the summer, it's a madhouse. Bob Melvin pinch hit lefty Olson to regain the platoon advantage. But pinch hitting in the first inning to get the platoon advantage - that's a pure Casey Stengel move. Aaaaaah, Melvin wouldn't have ever put DiMaggio at first base, I reckon. But, they have a ton of inductees. If MLB had the same level of representation, everyone we think of as even Hall of Good, would be in. Tennis inducts a similar number as MLB, 2-3 per year or so. Of course the dynamics are different for an individual sport; the 30th best tennis player is a footnote, the 30th best team-sport player is a franchise icon. But tennis is an international game. The 30th best tennis player isn't a footnote, he's the best tennis player in Canada! According to ZiPS in-season projections, the 30th best player in baseball is someone like Matt Carpenter, Anthony Rendon, Andrelton Simmons, Trevor Bauer or Gerritt Cole. FYI. I was curious. Put another way: Tennis and MLB (and the other team sports as well) each have roughly 30 HOFers active at any given moment. The difference is that the players ranked 10-30 in a team sport are each the face of a franchise, while players ranked 10-30 in tennis may well go a whole season without so much as reaching a semifinal. But it doesn't mean those tennis players are worse relative to the top or less deserving of their hall of fame than are the equivalently-ranked team-sport players. Well, there's no hard rule that there ought to be 30 HOFers at any given moment in a sport. The 30th best backstroker or ski jumper or steeplechaser is a ####### chump. Meanwhile, in soccer, with several top leagues and dozens of elite teams, the 30th best player may be an outright legend to millions. I can't decide if this is entirely fair, but Dennis Rodman is in the Basketball Hall of Fame. If you think of the primary goal of basketball as being to score baskets, Rodman pretty well shirked that duty and hoped that the other players would miss shots that he could rebound. Not exactly the same thing, but I feel like it's at least in the right general neighborhood. The 30th best backstroker or ski jumper or steeplechaser is a ####### chump. Why? Only because we give those sports less notoriety. If there were 30 Major League Backstroke teams playing for 30k fans every day, we'd be idolizing and inducting the 30th best backstroker. I thought of Rodman, Kiko, as you say because of his indifference to offense; but rebounding is so central to basketball that it didn't seem quite the right analogy. It's a little like defense in baseball: an infielder makes a play because the batter has failed to hit the ball over his head, but making the play is still his basic job. It's the Hall of Fame. Notoriety is kind of important. For good measure, Ray Chapman was beaned on 8/16, though he died on the 17th. And Will Rogers -- along with Elvis and The Babe, one of the most beloved Americans of the 20th century -- died on August 15th, 1935. So, two kings and a queen died on August 16th. I can't decide if this is entirely fair, but Dennis Rodman is in the Basketball Hall of Fame. If you think of the primary goal of basketball as being to score baskets, Rodman pretty well shirked that duty and hoped that the other players would miss shots that he could rebound. When you have Michael Jordan on your team, do you really need another guy trying to take a lot of shots? I have no idea of the validity of this, but this article presents the proposition that Rodman was arguably the most valuable player in the history of the NBA. Of course that is ridiculous, because it ignores Rodman’s true calling: international diplomacy.